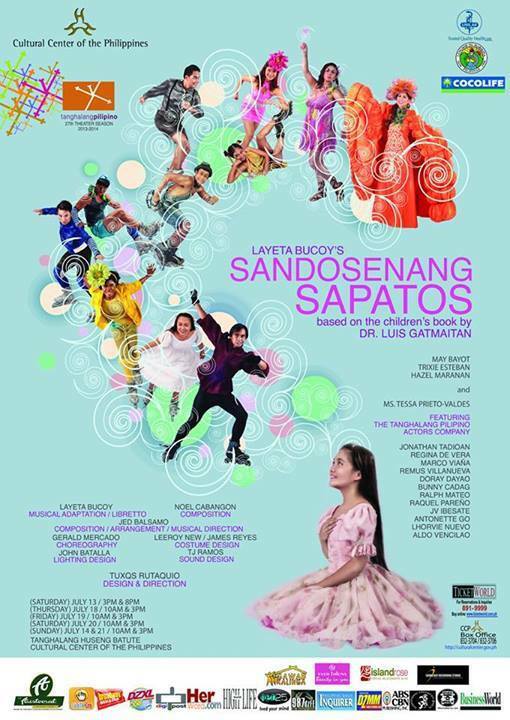 Tanghalang Pilipino’s Sandosenang Sapatos by playwright Layeta Bucoy, will be running for two weekends from July 13 - July 21 at CCP’s Tanghalang Huseng Batute. Co-produced with the Cultural Center of the Philippines in coorperation with the City of Marikina under Hon. Mayor Del De Guzman, the play is a musical adaptation of Dr. Luis Gatmaitan’s Palanca award-winning book of the same title. Gatmaitan wrote the story during a scholarship training in Tokyo, Japan, where he explored writings which revolved around the motifs of love, respect and concern that society can give to disabled people. Wheelchair bound Susie goes to dreamland demanding that the Shoe Fairy gives her a pair of feet the night before her shoe maker father's birthday. She wants to fulfill her sick father's wish of having a ballerina for a daughter. Unfortunately, the Shoes in Susie's dream maintain that she can only talk to the Shoe Fairy the night before her own birthday -- yearly, the Shoe Fairy gives her a pair of shoes and yearly, for a night in dreamland, she is able to dance. Forced to leave her dream, Susie wakes up and gives her father a music box containing a dancing ballerina. Unable to fulfill her father's wish, she goes back to dreamland, only to be thrown out by the Shoes for she should take care of her sick father instead of loitering in dreamland. After Susie's father dies, she finds herself in dreamland the night before her 12th birthday. As per their yearly ritual, the Shoe Fairy shows herself to Susie. This time around, not only does Susie refuse to talk to the Shoe Fairy, she also refuses to accept the fairy's expected gift of a pair of shoes. The Shoe Fairy reveals that the shoes she's been giving Susie does not really come from her. She tells her that on that night, the eve of her 12th birthday, Susie will meet the real source of the shoes. Susie's father appears bearing a pair of shoes. He gives the pair to Susie. With the pair of feet the Shoe Fairy annually gives Susie, she wears the pair of shoes and for the first time, she is able to dance with her father. When Susie wakes up on the day of her 12th birthday, she happily tells her mother and older sister that her father visited her in her dream. Her mother and her sister tell her that her father's love for her is so huge that not even death can take it away from her. They start to prepare for Susie's birthday celebration by cleaning the house. As they are cleaning Susie's father's room for making shoes, they discover a huge box containing 12 pairs of shoes. The pairs of shoes are of different sizes and each pair comes with a note. Each note is Susie's father's letter for her, each one expressing his love, each pair of shoe carrying his hope that though Susie does not have a pair of feet, she'll still be able to walk and even dance through life as a complete person bereft of bitterness but with an understanding of life as huge as his love for her. Tanghalang Pilipino: "Tinatawid ng Pagmamahal ang Panaginip"
Tanghalang Pilipino: "Sa Panaginip Lang Akong Minamahal"
Tickets also available at CCP Box Office: 832-3704 and all TicketWorld outlets. Call 891-9999.